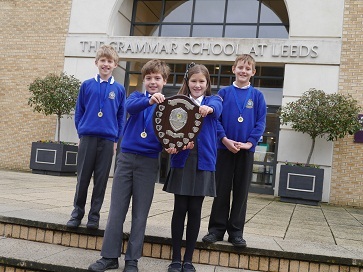 Talbot Primary School got their sums right to take the trophy in the annual maths competition for year 6 pupils run by The Grammar School at Leeds (GSAL). From 52 schools that fielded teams in the two semi-finals at GSAL, 21 schools made it through to the final of the Leeds Junior Schools Maths Challenge. The teams of four tackled fun maths questions based on the school curriculum, and in a high-scoring competition Talbot Primary School emerged as winners. Talbot came six points ahead of their nearest rival, Richmond House School, who were just three points up on third placed Spring Bank Primary.